And before you know it summer is quietly exhaling its last long breaths and the July edition of Is My Blog Burning? is upon us. Our hardworking host, Clement of the awe-inspiring A La Cuisine! has chosen tea as our unifying gastronomic principle this month. What can one do with tea? Although tea is consumed in copious quantities across Europe and North America, it rarely finds its way into anything besides a drinking vessel. Iced tea, hot tea, green tea, black tea, chai tea, tea with milk, tea with lemon, tea that is not really tea at all but peppermint leaves or chamomile flowers… Tea is ubiquitous, but it rarely shows up in anything solid. At least not in Western cuisine, which perhaps explains why tea-flavored food instantly conjures up the Orient, where tea is used not just as the basis of a drink but as a flavoring in itself. The recipe I finally chose to highlight tea, however, is a kind of fusion, or rather a friendly handshake between two very traditional Western preparations (soufflé and ice cream) and two sophisticated Eastern flavors (jasmine tea and lemongrass). I actually stumbled across this recipe quite by accident when I was planning to make something else with tea, yet the seductive harmony of tastes this dish was promising had me instantly converted. If you’ve ever had jasmine tea, you’ve probably never forgotten its haunting perfume. Unlike jasmine rice, which is a rice with a natural jasmine-like scent, jasmine tea is made by actually layering tea leaves with freshly-picked jasmine blossoms, and leaving them to dry until the tea is completely infused with the flower’s scent. The flowers are normally removed before packaging, but the tea I bought for this dish (from a local bulk-tea merchant) still contained them, small and wrinkled and oh-so-jasminey. The effect of this on the soufflé was quite powerful, the fragrance of the flowers deeply permeating the airy batter. It also married perfectly with the ice cream, which is subtle enough to not mask the tea but rich with its own herby, citrusy complexity. The two components create really quite an amazing partnership of taste and texture, enhanced even further by the contrast between the blistering-hot soufflé and the frosty ice cream. The only problem is the timing – like any soufflé these must be served immediately upon coming out of the oven, and especially topped with the ice cream you have a race against time to serve your guests anything but a gloppy puddle of mush. Not that it would be the end of the world – after taking the above photograph I had only a gloppy puddle of mush left, but that didn’t stop me from licking the dish clean! In a non-reactive saucepan on low heat, mix tea, cream, milk and vanilla pods and bring to a simmer. Simmer for 20 minutes then take off stove and let steep an additional 30 minutes. Strain infused liquid and re-heat with the honey to a simmer. In a stainless steel bowl whisk together the 10 yolks, cornstarch, salt and 1/4 cup of sugar. Temper the yolks by adding only a ladle of hot infused cream to the yolks. Mix well then add tempered mixture back to the saucepan. On medium heat, whisk constantly until it thickens then cook an additional 3 to 5 minutes. A pastry cream texture should be achieved. Transfer base to a baking dish, seal with plastic wrap and place in refrigerator. Base can be made 24 hours in advance. Pre-heat a sheet tray in a 375F oven. Whisk the egg whites with 1-tablespoon of sugar in an upright mixer equipped with a whip attachment on slow. In about 8 to10 minutes soft peaks will be achieved. Add the rest of the sugar and whip at high speed for two 5 second bursts. In a large stainless bowl, hand whisk the chilled infused cream base until smooth. Using a spatula, gently fold in the egg whites. Work quickly, but do not over mix. The base needs to be one homogenous color. Fill ramekins to the top. Drop each one from a height of 3 inches onto the counter to disperse any unwanted bubbles. Place on heated sheet tray and bake for 12 minutes. After 6 minutes the soufflés will start rising. Check the rising soufflés to see if any edges are getting caught on the rims of the ramekins; if necessary open the oven door and carefully slice the sticking part with a paring knife (you won’t ruin the soufflés if you work fast). The soufflés will straighten themselves out. 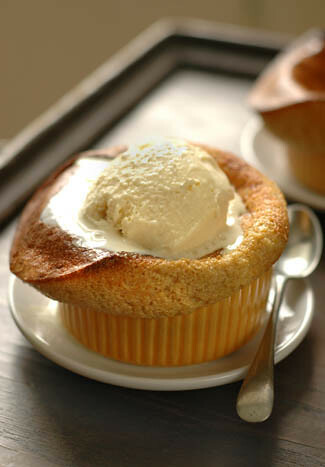 When the sides of the soufflés are golden brown (the key to a soufflé not falling is the crusty, golden brown sides), pull out of the oven and dust the tops with confectioners’ sugar. Serve immediately with a scoop of the lemongrass ice cream. In a non-reactive saucepan, simmer the milk and cream with the lemon grass and until it has reduced by one-quarter. Cover, set aside and let the lemon grass steep for several hours, or even overnight. Strain out lemon grass and heat the milk and cream with sugar and salt. Bring to a simmer. Hand whisk the yolks in a bowl until frothy. Temper the yolks by adding a cup of hot milk to the yolks and stirring quickly to combine. Carefully add the tempered yolks to the sauce pan, whisking constantly. Whisk constantly on medium heat until lightly thickened (do not let boil!). Strain the mixture, then cool completely in the refrigerator or an ice bath. Follow manufacturer’s instructions for your particular ice cream maker. Soften slightly before serving. As always, a delicious post. shouldn’t that have been “an incredibly delish pile of mush”? *grin*Have you tried jasmine tea pearls? They are sooooo good! Sounds and looks lovely, as always, Melissa. I like jasmine tea a lot – especially as my friend recently brought back some of those beautiful jasmine tea balls from China that open up like a flower in your teapot.. Are those what you call jasmine tea pearls, Clare Eats? I’m curious now. Hi Melissa,Thank you for trying this recipe. In fact, it was something that I considered making for this month’s IMBB. Now that I know it’s good, I’m going to make this sometime soon. Hi Melissa! Hope you’re having a good time in the States. A few questions from a layperson: What do you mean by a non-reactive pan? And is there any particular reason why you should whisk the egg yolks in a stainless steel bowl? What a lovely blend of flavours and a stunning image! Clare mentioned Jasmine Tea Pearls. I love them. They’re hand-rolled balls of jasmine tea that unfurl as you steep them. Definitely try them if you ever come by any. Hi Chubby Hubby – Thanks! I was actually just admiring your three-part symphony of tea… Wow!Hi Paz – I love jasmine rice too. It has always amazed me because it naturally smells like jasmine – isn’t nature amazing? :)Hi Clare – I’ll let you take care of the poetry from now on ;)Hi Michele – I’ll have it ready and waiting! 🙂 And you’re right, the lemongrass ice cream was incredible. I’d never had it before but started thinking it would make a killer ice cream flavor, and it sure did! When I start my ice cream empire I’ll be sure to have it always on the menu ;)Hi Malka – Jasmine is quite an amazing scent, I completely agree! Hi Pille – That’s really interesting, I’ve never seen jasmine tea pearls, but I’m definitely going to look for them now!Hi Reid – Wouldn’t that have been funny if we’d both made the same thing! Well, your fish looks just as delicious, and I imagine it would make the perfect prelude to the souffles. :)Hi Dharshi (& Paz) – It’s obvious that I just copied the instructions over without doing much editing, isn’t it! In fact, a non-reactive pan is anything besides copper, aluminum or cast iron (anodized aluminum or enameled cast iron are fine). These types of metals can react with acidic foods to change the color and/or flavor of the food. Chances are you do most of your cooking in stainless steel or teflon-coated nonstick, so you won’t have anything to worry about. Also, I don’t think there’s any special reason to use a stainless steel bowl for the egg yolks – Ming just seems to belong to the ‘hand-holding’ school of recipe writing which tries to avoid confusion by specifying every last detail!Hi S – Thanks! And I’m definitely on the lookout for jasmine tea pearls now. Thanks for the recommendation! gorgeous! unfortunately, my palate is jaded? dead? lacking? that i can no longer taste jasmine all that well in teas. years of conditioning? still, i’d make this recipe to wow the crowd 🙂 ps–i don’t have a post on jasmine tea pearls, but one on some crazy <a href="http://scentofgreenbananas.blogspot.com/2005/02/magical-tea-balls.html“>balls i think you’d like…. Hi Pille yep thats them. I will do a post on them tonight! Hi Clare Eats – thanks – looking forward to reading your post. I wrote something on that tea recently myself, see at http://nami-nami.blogspot.com/2005/07/flowering-tea.html if you can. Hi Melissa,Wow – What a great IMBB entry!! Beautifully captured, the souffle looks delish. Souffles should have been in my response to the Mageiricophobia-meme-question. I think your post came just in time to remind me to step outside my comfort zone and give it a shot…the result speaks for itself ;)And as far as the ice cream goes, I’m a sucker for anything that has lemongrass in it! Hi Melissa,I realize that this an absurdly belated response, but I’ve only just realized that there is a wide world of food blogging I never knew about (yours is a great favorite, I must say).I’m living in Beijing now, but I hail from San Francisco. While in China, I discovered that my favorite "tea" didn’t involve any tea leaves at all. Rather, it’s dried jasmine flowers (and only the flowers), which are sold in bulk — either out of bamboo baskets on the streets in the South or at markets in big woven bags up here in the North. Dried, they resemble nothing more than ancient flakes of crepe paper, but when steeped, they unfurl into a beautiful snow-globe like pot of floating flowers (there’s a similarly brilliant rose petal "tea" here) and taste of nothing but pure jasmine.I appreciate that jasmine flowers are probably extremely difficult to find outside of China, so I do supply an alternative: jasmine extract. I discovered this tiny bottle of flower heaven at my local Chinese supermarket in SF (New Mei Hua or however they spell it), along with lemongrass, pandan, durian(! ), and good ol’ vanilla extracts. While the flavor is very strong and not at all as delicate as the "real" thing, I’ve had great results when adding a bit to whipped cream. I was going to try it in creme brulee, but I left my kitchen behind for my China adventure before I got around to it. Hi Ashley, thanks for your fascinating comment. I’ve never run across jasmine extract, but the thought of it is very seductive – after all, I put rose, orange blossom and lavender extracts/flowers in as many things as I can. There is a large Chinese supermarket here (well, large for Scotland), and I’ll definitely take a look at their extracts next time I’m there. That tea you mention sounds amazing as well – how beautiful to have whole flowers floating in your cup! Hopefully I won’t have to wait until I make it to China myself before I have the chance to try it. That sounds delicious although a little too complicated for my skills still. But I will definitely try this sometime in the future. I absolutely adore the smell of jasmine and lemongrass, to have them in my food would be a real treat!